What's the point in moving an engine to the back to drive the rear wheels if you can't light up those rear tires? That's what the folks behind the Motore Centrale R230 have evidently figured, taking the mid-engined Fiat Abarth 500 for a spin or two around the back lot at a racing circuit. The R230, for a quick refresher, is the first product of Lucarelli Monza, with an interior done up by Aznom. The comprehensive re-engineering of the car involved moving the engine - with some serious modifications - to the back of the car for entirely different dynamics from the Cinquecento on which it's based. We brought you initial details of the car's development last month, followed by its unveiling at Top Marques Monaco. Now the same snap-happy videographers at Marchettino have given us footage of the R230 pulling donuts in a parking lot. 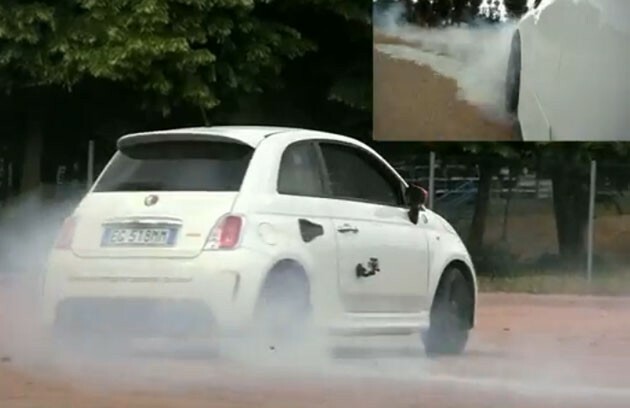 And while the driver may not exactly be Tanner Foust, it's worth a watch, so check it out after the jump.Abarth 500 Motore Centrale R230 burns through its shoes originally appeared on Autoblog on Thu, 26 May 2011 16:57:00 EST. Please see our terms for use of feeds.